We attend at the stake center at 9am, 12pm, or 3pm. 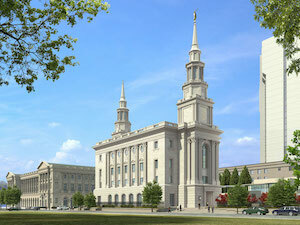 Must have a temple recommend or temporary blue card obtained by bishop interview to enter stake center for dedication. The bishop will post a sign-up schedule. It is encouraged that even temple recommend holders get a blue card. Arrive to dedication more than 15 minutes early. Doors will be locked 15 minutes prior. Temple open houses run from August 10 to September 9, 2016, every day except Sundays. Tickets are free (obtained through registration link above). They are not necessary, but they help to avoid unnecessary waits. Printed invitation cards are available at the church (in English and Spanish). Please take as many as you need. Tours run approximately every 5 minutes and take 45 minutes. They begin with a video in the meetinghouse next to the temple and then tour all four floors of the temple. Public transportation or carpooling is encouraged because parking is limited. Our stake has been asked to fill over 800 volunteer assignments on the dates listed in the table below. From that, our ward has been asked to fill 109 of the assignments. As of July 16, our ward has 72 filled so far. Volunteer sign-up uses SignUpGenius. It is easy and free to register an account with SignUpGenius, but it is not necessary. If you do, you can easily login at a later time to make changes if needed. Otherwise, I believe you would use an email link to make changes. On the sign-up website (link above), there are separate tabs at the top for July, August, and September. You will be shown a list of all available service dates and times. You are welcome to volunteer for any time slots, but the slots assigned to our stake will be indicated in capital letters: "EAST BRUNSWICK ASSIGNMENTS." Check as many sign-up boxes as you would like and then click "submit and sign up" at the bottom. You will then enter your name, ward, and other information. Each volunteer must complete this process separately, even if you are members of the same family. Security Volunteers: We are in need of more volunteers to provide help with security. Professional security, public safety, 1st-responder, or police experience is preferred, but not strictly required. Please emphasize this as you encourage members to volunteer. They volunteer using Sign-Up Genius. They will then be contacted by Ed Kline, Security Sub-Committee Chair, or one if his committee members to learn more of the volunteer's background. Dress Code: The dress code for all volunteers is Sunday dress. People should wear comfortable shoes. Parking: There is free parking for volunteers in a lot on the corner of Broad Street and Noble Street. However, public transportation is still encouraged for volunteers. Volunteer Parking: There is free parking for volunteers in a lot on the corner of Broad Street and Noble Street. However, public transportation is still encouraged for volunteers. The open house tours will be fully wheelchair accessible. Parking under the temple (entrance on 18th Street just before Wood Street) has some handicapped parking spots. If handicapped parking spots are occupied, there will be a handicapped drop-off/pick-up point on westbound Vine Street, between 16th and 18th Streets, right next to the temple and meetinghouse. If you are not able to bring a wheelchair, wheelchairs will be available for the tours. Someone will be available to assist with the wheelchair throughout the tour. Home teachers and visiting teachers should distribute these to the families they visit each month. Not an official church website. Contact Paul Cuff.